This past Wednesday, The Heritage Group Sports Business Academy hosted their second annual Ben L. Cavil Sr. “Big Ben” Awards dinner at the Crowne Plaza Hotel – Medical Center. This award’s dinner kicked off the HBCU-Athletic Research Consortium (HBCU-ARC) Conference. Dr. Kenyatta Cavil, the founder of the Ben L. Cavil Sr. “Big Ben” Awards, wanted to create an award to highlight and honor athletes who currently play football at HBCUs across the country, as well as athletes who are either from the state of Texas or currently play football at an HBCU in the state of Texas. The finalists for the “Big Ben” Award for 2016 were Ty Gatson from North Carolina Central; Sean Jones from Texas Southern; Devante Kincade from Grambling State; Eric Medina from Texas Southern; Terrance Singleton from Prairie View A&M; and Cornelius Henderson from Jackson State. 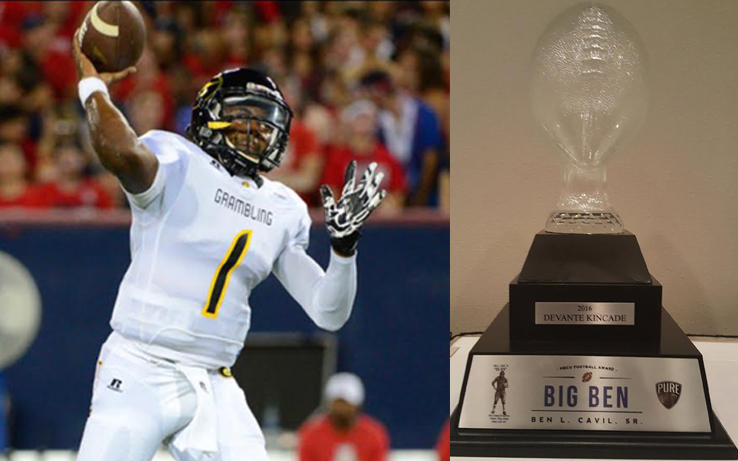 The winner of the “Big Ben” Award for 2016 was Grambling State quarterback Devante Kincade. Kincade had a stat line this season that was incredible, with 2,633 passing yards; 28 touchdowns; and only 3 interceptions. Kincade has been able to lead his team to the SWAC Championship Game in his first year in the conference. Kincade was named Offensive Player of the Year for the SWAC. Kincade made the decision to transfer from Ole Miss to Grambling State in order to be closer to his mom who had suffered a stroke just two years ago. Other awards were also given. Ty Gatson was the winner of the Online Fan Vote. This was the first time an offensive lineman was nominated for the award. Gatson has been one of the anchors on the Mid-Eastern Athletic Conference (MEAC) Champion North Carolina Central team. North Carolina Central was able to shut down the defending Celebration Champion, and their rival, North Carolina A&T, in the last game of the season, which helped punch their ticket to this season’s Celebration Bowl. Head Coach Michael Watkins from Jack Yates High School was the winner of the Community Service Award. Coach Watkins took the Yates football team to a 7-4 season, which included a playoff appearance.